Well, I made it through Black Friday without being maced or punched in the nose. By the time I stuck a toe outside to do some shopping, it was well into the afternoon and the rowdiest of crowds had gone back to bed. There are plenty of people who view Black Friday shopping as sport — and not the kind involving fisticuffs. It’s never been my thing, though. I try to match presents to their recipients in a thoughtful way, not just because there was a sale on a big-screen TV. Years ago, I’d have finished my shopping by now, or be nearly done, and have moved on to wrapping and crafting intricate bows. One day I’ll get that organized again. This year, I figured I’d better strike while I had a bit of time. So, with plenty of deep breaths and not a small bit of anxiety, I took my 20 percent-off coupons and ventured to Lord & Taylor. Imagine my surprise to find a parking space without much trouble and the store busy but not overwhelmingly so — as long as I steered clear of women’s shoes, which was pretty much a free-for-all. I lucked out and found a couple of presents. Saturday afternoon found me at the Stamford Town Center, again filled with trepidation. Catherine and a friend were headed to a movie, so I figured I’d shop while they watched the vampires. As was the case the day before, the stores were busy, but not crazily so. Even at 3 pm, the various stores’ staffs remained upbeat and friendly. Basil was with me this time, and as long as I kept my eye on him (he has an awful tendency to wander off; I then waste oodles of time trying to find him) we were good. 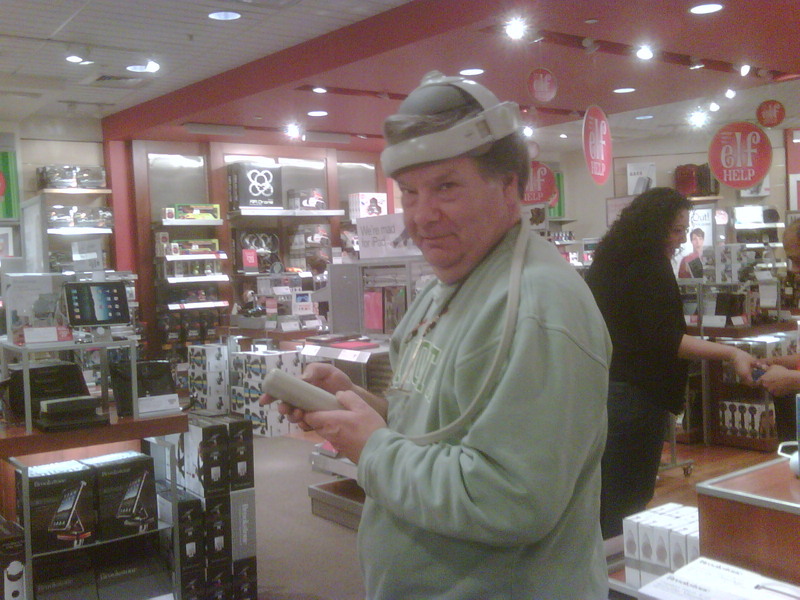 Basil tests a head massaging contraption at Brookstone. Amid the clothes racks, jewelry counters, and various displays at Williams Sonoma (nice samples of Peppermint Bark, btw), we even had time for some fun, as this photo taken in Brookstone attests. Still, this vision wasn’t the craziness thing I encountered in my brief shopping forays. I loved the man in Lord & Taylor, who sat quietly reading a book amid the loud, frantic chaos of the ladies’ shoe department. And I’m still trying to sort out the brain power of the father who allowed his daughters, approximate ages 6 and 4, to race up and down the corridor between Macy’s and the movie theaters on their razor scooters. There were many near accidents. And yet the guy just sat and watched them rather than venture out in the balmy fall sunshine to take them to the park. Like so much of human behavior, you can’t make this stuff up.